Entering the dungeon, take a breath while you can, then march forward to meet a new breed of Lizardman, Squatters and Defenders. There may also be a stray executioner. Returning to the main corridor you can choose to pass through the sparkles to level 2 or explore the Eastern branch which is similarly occupied with Hungry Ogres and Cave trolls. Another mysterious tunnel can be found behind the cells and the sparkle here also goes to level 2. To the West you will find Brigand Cannibals, Executioners and an accompanying Brigand Cannibal Mage. Little is known of these human occupants, animal lore can discover nothing about them. They hold in their cells several prisoners, which they are very reluctant to release. Doors are locked and they will slay the prisoners rather than allow them to be rescued. It is a doubty warrior indeed who can succeed in escorting these poor souls to safety. At the time of exploring the East branch was largely deserted, but residents of the rest of the level may stray here from time to time. Behind the buildings can be seen a Demonic Jailor, but no obvious path to reach him exists. Entering the northern branch of this level you are first met by Savage Pack Wolves and mages of similar skill to that found on level 1. Here too you will find Fezzic, the Ogre cook. Should you anger him he will call upon his gooey maggots who’s dripping green goo will hamper your progress with its stickiness. Little else is known of Fezzic, for we have no reports of his being defeated. What relevance he has to the Hungry Ogres above is yet to be revealed. 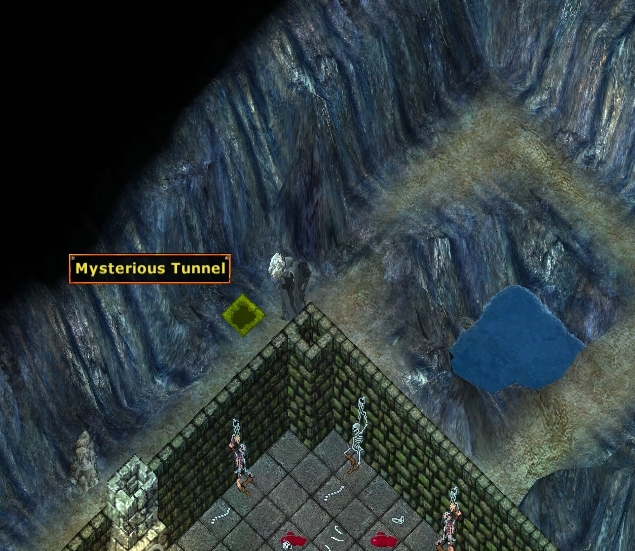 To reach the Demonic Jailor you must explore the mysterious tunnels, travelling through them randomly until one of the leads to your destination. Should he arrest (hit) you he will transport you to the Prison of Nightmares, a confusing maze of moving walls. At its heart you may find treasure, but stealing it is hazardous, for it burns! In describing this prison a picture is worth a thousand words, and a moving picture many more. Please watch the video linked above, kindly recorded by Storm. Storm has also recorded An Exploration of Wrong Dungeon on Test Center for your enlightenment.